We're happy to announce D.A. 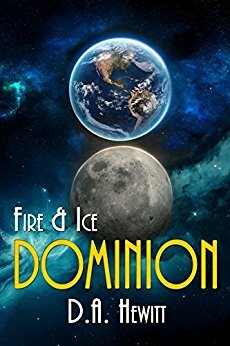 Hewitt's DOMINION: FIRE & ICE is available now! You can find out more about his book below. Please leave a comment to let him know you stopped by and you can pick up your copy at Amazon (link below)! The girl shook her head impatiently, the ponytail swaying back and forth. “You don’t recognize me?” she asked. I thought Julia was going to leap out of her chair and try to strangle the girl. I reached over and laid my hand on her forearm with as much reassurance as I could muster. My reaction caught me by surprise. I jerked back as though jolted by a cattle prod such was my surprise at being accused of something so off my radar that she may very well have accused me of being an alien in disguise. “What?” I managed to eke out. I held up two fingers, eyebrows raised with uncertainty. She throws out big tomatoes and observes your reaction. I realized that this woman believed she possessed the skill to discern changes in blood pressure, eye dilation, and other change indicators that revealed when a person was lying. She took a step to her left, then to her right. She placed her hand on her chin, opened her mouth, then finger-tapped the side of her head. She looked like a frenzied shopper who’d lost her shopping list and was trying to recall each item in the order in which they appeared. She reached up and pinched her nose. Instead of finding it annoying, I found myself attracted to it. Julia jabbed me with her elbow. I leaned over and whispered, “Let’s see how much information we can get.” Then I kissed her neck and this seemed to appease her. Jessica Thibideau glanced back at her sedan. “All right. I am starving.” She sat and whispered a command that brought up a translucent eight-panel octagonal grid interface that encircled her. Impressive. But where’s the projector? An implant? No—more likely embedded in clothing. “Out of this world,” I said, trying to suppress the corner of my mouth from rising slightly. I failed. Jessica closed her eyes, sighed, then placed her order. “Permanent jitters, in her case, if you ask me,” Julia commented. D.A. 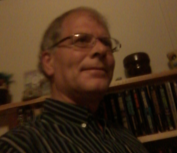 Hewitt is an award-winning author of four novels and over a hundred short stories. One novel was awarded a gold medal from the Independent Publishers Book Awards for best regional fiction. He attributes his success to hard work, honing a skill and providing an outlet for his passion for writing. Born in Michigan, he lived for 25 years in North Carolina before returning to live in his home state. In addition to enjoying sky diving and mountain climbing, he is a proud veteran of the US Marine Corps and has earned a degree in mathematics.